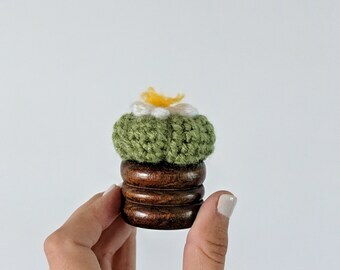 Crochet Succulents for Reformed Plant Murders. Announcement Oh my gosh! Hey there! Thanks for stopping by! Please note, any orders made from 3/30/19-4/8/19 will ship out on 4/10. Please ditect message with any questions. Thanks! Oh my gosh! Hey there! Thanks for stopping by! It all started in the dark. A dreary one bedroom apartment filled with death. All the beautiful plants that thrived in my brightly lit South Philadelphia home, all slowly withered away in my Florida hovel. I was truly heartbroken. I began to buy new plants and carefully follow their "low maintenance" instructions. Over and over again I was met with the same disappointing fact that these plants deserved so more than I could provide them under such dense canopy cover. I had to come up with a solution. I need life. I crave color. I bloom from people coming into my home and squealing with delight, sharing my joy for my beautiful plant babies. I longed for long conversations of plant characteristics, passing of tips and tricks, and the ever beautiful phrase "Can I please have a clipping!?" 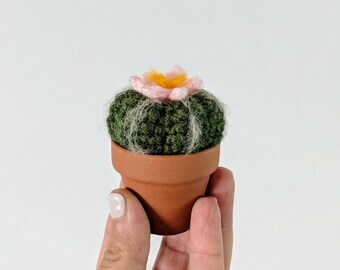 I dug deep into my stash of yarn and found the perfect shade of green, the perfect shade of pink, and created the end of my plant murdering spree. 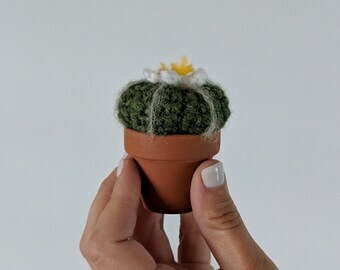 Each Little Prick is joyfully designed with love and respect for all the plants we've involuntarily put out of their misery. May they always grow in our hearts. We believe in eating ice cream for breakfast and having breakfast for dinner. We believe in living each day like it's Taco Tuesday. We believe that plants have feelings too. We believe you can bloom no matter where you've been planted. We believe there is no man (or woman) on Earth that can tell us what we can, or cannot do with our own bodies. We believe there is no such this as "can't"... only "can't do yet." We believe there is enough space for everyone to succeed. We believe that smiling is contagious, and our favorite. We believe that teamwork really does equal dreamwork. We believe that if speaking kindly to plants helps them grow, imagine what speaking kindly to humans can do. Jamie Leigh Griffiths is a giddy little lady who loves "terrible" movies, "that's what she said jokes", leopard print, and Game of Thrones lore. 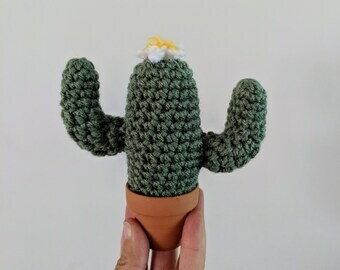 Jamie loves crocheting, crafting, comedy, cartoons, carbs, cacti and other things that start with c.
It's about time you got here! I've been waiting for you! I can't wait to show you what I have to offer! If you don't feel like my product is incredible then I will give you a 100% refund. This is full-time job and I take customer service VERY seriously. Yes, I have a refund policy! All I ask in return is that you come to me personally if there is a problem so that I may fix it immediately! I hope you <3 my payment policy as much as I do! I accept Paypal payments, credit cards through Paypal and Etsy Direct Checkout, and Etsy gift cards through Etsy Direct Checkout. I would love to ship your item but I simply cannot until payment is processed. 1.) Add my item to your cart. 2.) Click to checkout and pay with your preferred method. 3.) Wait for your awesome-sauce package to arrive from Whimsy McGee! Every item is one of a kind and ready to ship. Custom orders will typically take 7-10 business days for your handmade item to be brought to life. You will receive a tracking number the moment your item has shipped. I exclusively use USPS to ship all domestic US and International orders. Orders are shipped from Florida via USPS first class mail immediately after payment to the address specified through Etsy. International orders will not receive a tracking number, with the exception of Canada. I have no control of how long a shipment takes to get through customs, especially during the holiday season. Duty and import tax is the responsibility of the customer. If you would like insurance or a quicker method of shipment please message me. Custom orders and special requests may take longer, in which case I will communicate with you through Etsy's conversations tool. Shipping costs include the cost of packaging and handling. The items will be tastefully packed and securely packaged as if it were a personal gift. Overnight shipping is available within the US. I am sorry but this option is not available for international shipping. To ensure that your order is received before the holidays please place orders before December 10. Priority shipping is available upon request. Please message me before ordering so I can set up the item's page accordingly. I will do my best to ship your item in a timely manner but I have no control over how long that item takes to get through customs. Please keep that in mind when ordering. Priority shipping is available upon request. Please message me before ordering so I can set up the item's page accordingly. All items are one of a kind with the exception of patterns and DIY kits. If you would like a custom item I would love to make it for you! Send me a message via Etsy's conversation tool before you make a purchase and we will make your dreams come true! All items are handmade in a smoke free, pet friendly environment.